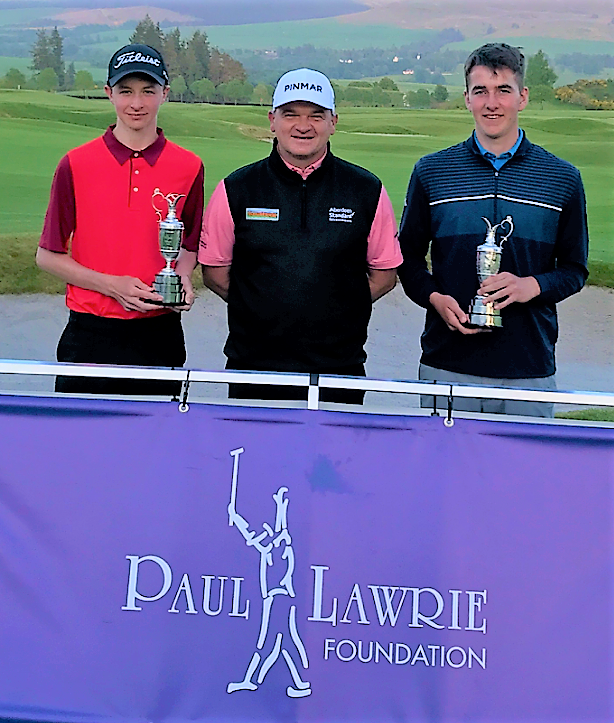 Left to right: Ben Carberry (Falkirk), winner of Junior Jug Handicap comp, Paul Lawrie, and Andrew Thornton, winner of the PLF Junior Jug Scratch competition at Gleneagles. Andrew Thornton from Lundin Golf Club, Fife, saved his best until last and it was his final round of two-under-par 66 over the Queens Course, Gleneagles that enabled him to overhaul the leaders and win the prestigious Paul Lawrie Foundation Junior Jug tournament at the Perthshire venue. Thornton opened his campaign with a four-over 74 on the Kings Course but then raised his tempo on Sunday with a 69 on the Queens followed by his 66, a great round under pressure with six birdies (second, eighth, 10th, 11th, 13th and 15th) in halves of 36 and 30. He dropped shots at the first, fifth, sixth and 17th but did not allow these slips to affect his composure or determination. The Fife teenager won by three strokes from Ruben Lindsay (Ayr Belleisle) who had scores of 76, 66 and 70 for a total of 212. Liam Waldron (Royal Aberdeen) finished third on 213 after a pair of 68s over the Queens Course today (Sunday). Greg Dalziel (Airdrie), last year's Scottish U18 boys champion and the long-time leader in this tournament, was in a strong position after opening scores of 72 and 69 but he lost his sparkle - and the lead - with a five-over 73 in the final round. The Handicap Junior Jug section was won by Ben Carberry, who plays off 4 at Falkirk Golf Club, after a countback against Liam Waldron (Royal Aberdeen) (2) and M L Robertson (Glasgow) (5) who also had net totals of 207. Scratch winner Thornton, a two-handicapper, also had the lowest 54-hole net aggregate, but his scratch success took precedence, i.e.a player could not win both the scratch and handicap sections. 226 F Owenson (Nairn) 74 78 74. 153 H Austin (Loretto School) 80 73, R McAuley (Fereneze) 78 75, R Laird (Falkirk) 78 75, P Brown (Monifieth) 78 75, F Gardiner (Falkirk) 77 76, S Logue (Royal Montrose) 76 77, R Fenwick (Deeside) 76 77. 154 D Walsh (Lochgelly) 86 68, C A Gray (Kirkcudbright) 81 73, C Marshall (Royal Montrose) 70 75, J J Lockhart (Pitreavie) 78 76, S Sandin (Dunblane New) 77 77, B Clark (Alloa) 75 79. 155 L Fleming (Haggs Castle) 79 76, E Wheat (Royal Montrose) 79 76. 156 C Adam (Royal Burgess) 77 79. 157 F Sey (St Andrews New) 84 73, I Taggart (Lenzie) 79 78. 159 J Bell (Royal Aberdeen) 81 78. 160 J Bruce (Deeside) 85 75. 164 R Lovie (Duff House Royal) 79 85. 168 R Bain (Royal Montrose) 95 73, C Black (Royal Aberdeen) 85 83. 208 L Strath (Newmachar) (3) 72 70 66, L Reynolds (Hilton Park) (2) 74 69 66.